If you have read any of my baby shower posts, you have probably noticed that I am a huge fan of forgetting the often awkward baby shower games and instead completing a group activity or project. I've held a few no-game baby showers, and judging by the look of relief on the guests' faces they seem to be a welcome change-up. At a recent safari animal themed shower I tested an idea that has turned out to be my favorite so far - making a felt animal mobile! I think what I love most about this project is that the result was a special keepsake for the nursery made by friends and family. 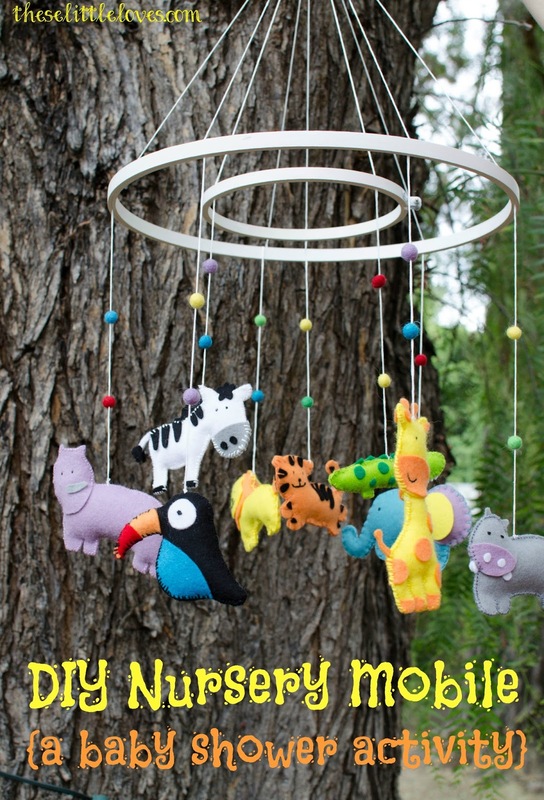 You might be thinking...'How on earth do you make an entire mobile in the span of one baby shower?' Well, you don't. But with a little planning and prep work, you can get the bulk of the work done while keeping it fun and relaxed. So, where do you start? With the mom-to-be. As a rule, when I am considering creating something for the nursery, I opt for discussing the details with the mom-to-be instead of keeping it a surprise. 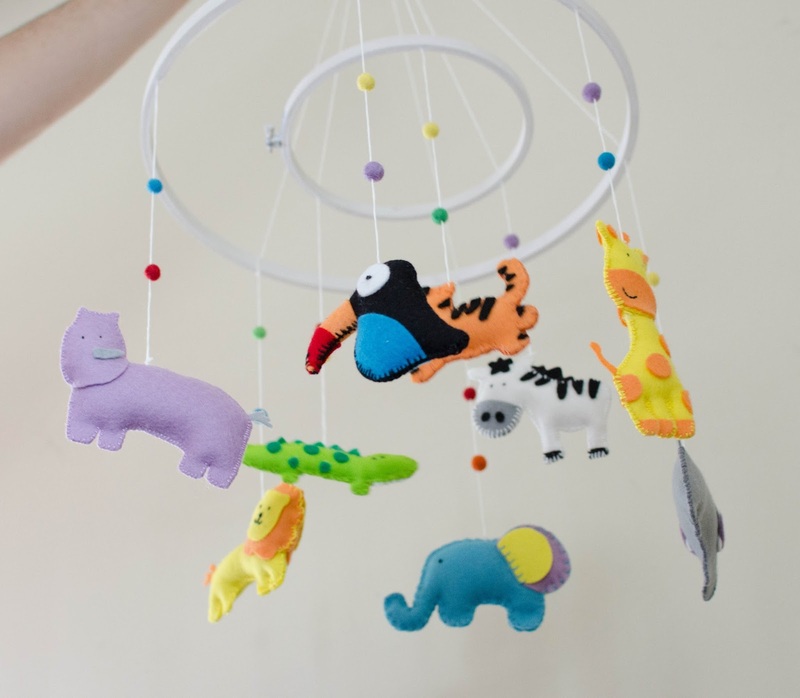 I know I was picky about what went into my nursery and you really want her to like it! I discussed a few potential projects with the guest of honor before we settled on the mobile. We also talked specifics on the animal designs, colors, and materials. Let her be as involved as she wants to be - this should be fun for her too:). As I mentioned, this project took a fair bit of planning and pre-shower prep work. You can draw inspiration for your mobiles from anywhere - pinterest, etsy, google images. Get creative! Inspiration for these animals came from various images and patterns online, though in the end I had to size and hand draw each one, adjusting the pattern so that each animal would be double sided. You can find all of my prep work, templates, and instruction packets here. We ended up with nine animals: toucan, lion, tiger, rhino, hippo, elephant, giraffe, zebra, alligator. The day of the shower, each guest received an activity packet including all the items they would need to complete her animal. We also placed a few shared supplies in the middle of the table: fabri-tac, scissors, pins, bamboo skewers and fiber-fill for stuffing. 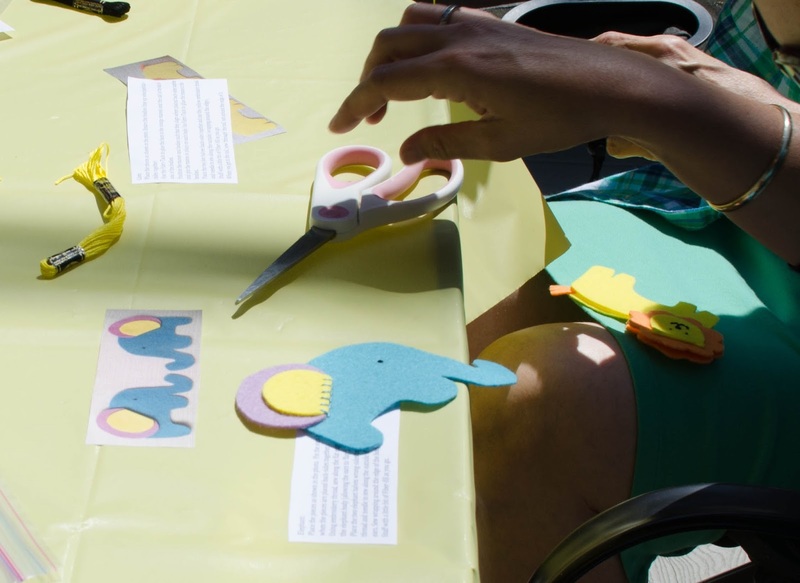 The guests were tasked with assembling the pieces per the photos, glueing on any details, lightly stuffing the animal, and sewing the border. This turned out to be plenty of work to keep them busy, and in the end I only had to finish up a few of the animals. One last quick note before I go into the after-shower mobile assembly - You might want to consider having an alternative project available for those less comfortable with crafting. This is also a good idea if you have more guests than mobile animals. A mobile with 23 animals might be a bit ridiculous (or it could be awesome - your call). 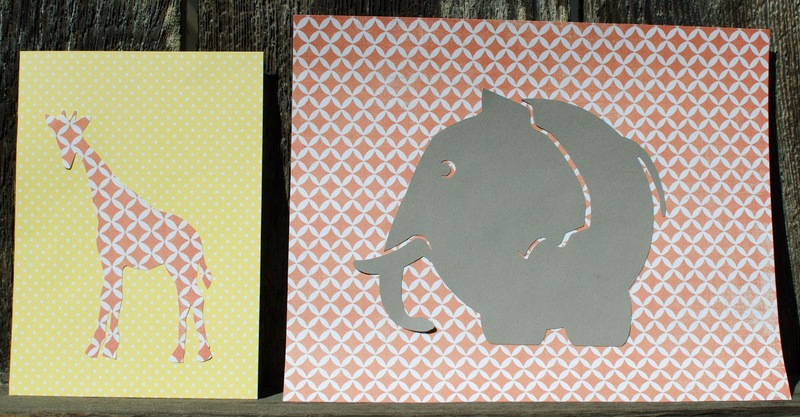 See my safari baby shower post for the details of the alternative project we chose - animal silhouette art. Final assembly of the mobile is too much to expect within the 'limitations' of a baby shower. Promising the guests that I would send pictures of the completed mobile, I packed up the animals and supplies for assembly at home. I'll also confess that at the time of the shower I wasn't entirely clear on the assembly specifics. Thankfully, it turned out to be easier than I expected. First, I attached a long strand of white embroidery thread to the top of each animal. It is important to attach this thread not necessarily in the middle of the animal, but at a point that results in a balanced animal (not slanted to one side). I put a small dab of glue on the knot to prevent unraveling. For additional decoration and color, I strung tiny felt balls on the thread above the animals. There are a few options for the frame of a mobile. I chose to use embroidery hoops - one 14" and one 7" diameter hoop, both painted white with craft paint. (I didn't think of this at the time, but you could also have a few guests paint the embroidery hoops during the shower.) After I decided how to allot animals between the two hoops and recruited my lovely assistant (aka my husband), I started the final assembly. Once all the animals were secured to thread, I fed each animal's thread between the two pieces of the embroidery hoop, spacing them evenly around the circumference. Gathering all the animal strands for the outer hoop together, I lifted the assembly off the table like it would hang from the ceiling. At this point my husband held the strands so I could balance the mobile. After carefully positioning the animals at the same height, I tightened the embroidery hoop to secure the threads in place. Then I tied the bunch of threads to a small wooden ring (also painted white), making sure the embroidery hoop stayed evenly balanced. Once the outer hoop was secured, I repeated the positioning and balancing of the animals for the second smaller hoop. Positioning the smaller hoop to hang inside and slightly below the larger hoop, I secured the second hoop threads to the same small wooden ring, again making sure the mobile stayed evenly balanced. 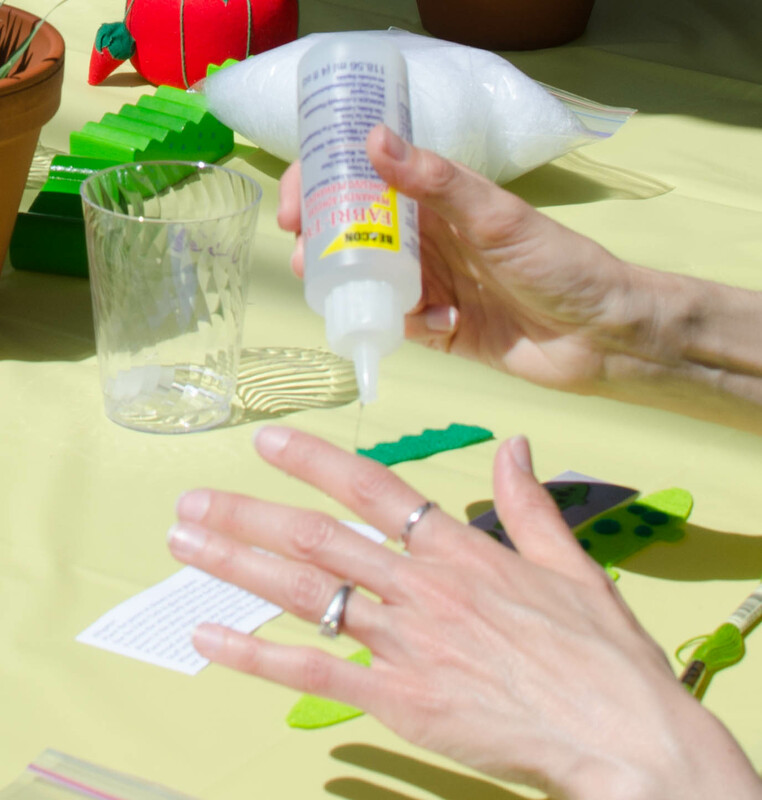 You can add small dabs of glue to secure parts of the mobile as needed. I delivered the mobile to the mom-to-be as soon as it was finished. I'm thrilled with how it turned out. It looks very happy to me. 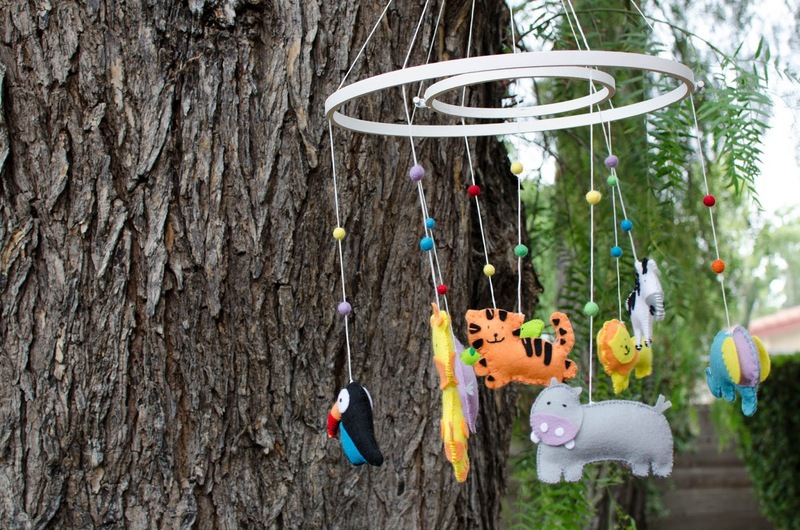 I have a feeling this is not the last mobile I'll be making at a baby shower. Embroidery hoops - one 14" and one 7"
So glad you like it! I've done it a few times now and it seems to work well every time. You can check out my other baby showers on the blog to see more designs! I'd love to see your mobile after the shower.